Davies Ranger Senior Light with Chicken & Rice is a hypoallergenic diet which has been specially formulated to satisfy the appetite of older, less active dogs. It provides fewer calories which helps to control their weight. The recipe contains premium quality chicken that provides essential protein and amino acids which all dogs need in their diet. Rice and maize provide the highly digestible carbohydrate balance and contribute to the taste of this gravy basted gluten free food. Yucca meal is also added to reduce mouth and stool odour. Cereals (min 4% rice), meat and animal derivatives (min 4% chicken), derivatives of vegetable origin, oils and fats, fish and fish derivatives, seeds, minerals, yeasts. With antioxidant: BHA/ BHT. Protein 18%, Oil 6%, Fibre 2%, Ash 7%, Vitamin A 10,000 IU/Kg, Vitamin D3 1,500 IU/Kg, Vitamin E 150 mg/Kg. Copper (as cupric sulphate) 15 mg/Kg. 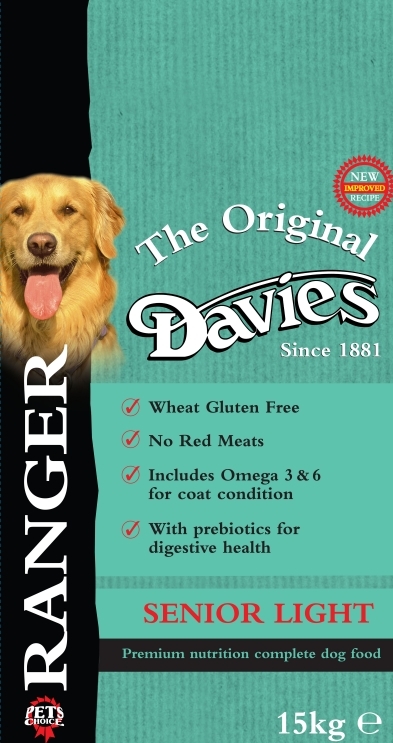 There are currently no questions for Davies Ranger Senior Light Chicken & Rice Dog Food - be the first to ask one!